Q: It is reported that this February, the National Archive of Japan submitted 19 photocopies of "comfort women" archives to the Japanese Cabinet Secretariat illustrating the involvement of Japanese military in the drafting of "comfort women" during the WWII. But senior officials from the Cabinet Secretariat denied that, saying that "on the whole, no accounts have been found directly showing forcible drafting". What is your comment? A: We have noted relevant reports. The enforced recruitment of "comfort women" is a grave crime committed by the Japanese militarism. There is iron-clad evidence and no room for denial. The Japanese government to this day still refused to acknowledge such evidence, which once again exposed its erroneous attitude towards history. I must stress again that the history baggage will not be relieved until the history is looked at squarely and reflected upon profoundly. We once again urge the Japanese side to take history as a mirror, take the concerns of relevant countries and the international community seriously, and properly deal with the relevant issue in a responsible way. Q: Acting Secretary of Foreign Affairs of the Philippines Enrique Manalo said in an interview that we have been stressing a comprehensive implementation of the DOC since 2002, and formulating the COC is in the same vein with implementing the DOC. At present, ASEAN and China are stepping up negotiations on a framework of the COC, which is an important step towards formulating the COC. Everyone is working in the right direction and a consensus on a COC framework is expected to be reached within the year. Do you agree with his remarks? A: It is true that at present, China and ten ASEAN countries are taking positive steps towards comprehensively and effectively implementing the DOC. And under this framework, efforts are being made to advance the consultations on the COC and maritime practical cooperation. Since the start of this year, with all parties upholding a pragmatic and constructive attitude, two rounds of consultations have been held on a draft framework of the COC, and relevant work is moving forward smoothly. 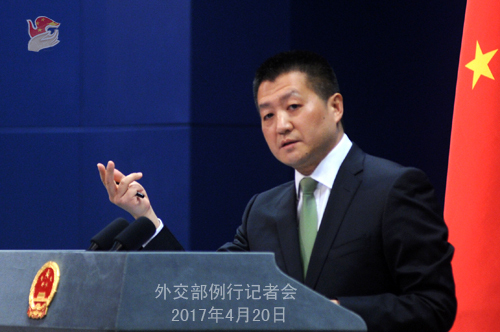 China is fully confident that consultations on a draft framework of the COC will be completed within the first half of this year. Going forward, China will continue working with ASEAN countries including the Philippines to further promote the comprehensive and effective implementation of the DOC and endeavor to reach the COC by consensus at an early date. Q: US President Donald Trump said in an interview that how much the DPRK's leader desires peace would be a deciding factor in easing tensions between it and the US. The US wants peace and hopes Kim Jong Un also wants peace. Trump said that it would be "the end determination". What is China's comment? A: We have noted that this statement by President Trump has already be extensively covered by many news media since yesterday. To peacefully achieve denuclearization of the Korean Peninsula and maintain peace and stability on the Peninsula through dialogue and consultation is the only viable way out of the Peninsula nuclear issue. It also represents the consistent stance of the Chinese government. Just like what I said here yesterday, in our contacts with major parties to the Peninsula nuclear issue, they all expressed that the last thing they want is conflict and war. What the majority of the international community hope to see is also peace. We hope that all relevant parties can forge consensus and make concrete efforts under this principle and in this direction. Q: The China-Australia High-level Security Dialogue will be held tomorrow in Canberra. Who will represent China to the Dialogue? 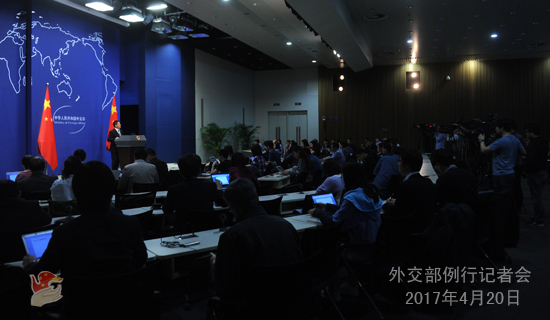 A: China and Australia are cooperating with each other on law enforcement and security, and some arrangements have been institutionalized. As for your question, we will release relevant information in due course. Q: Reports say that US President Donald Trump is asking the Commerce Department to carry out a probe into whether imports of foreign-made steel are hurting US national security. What is your comment? A: We responded to this question before if my memory serves me right. First, we need to check the authenticity of the reports. And if they are true, we still need to evaluate the coverage and target of such probe before making any judgment. If you raise this question because of concerns over trade issues between China and the US, I can say something in principle. We keep saying that the economic and trade relations between China and the US are in nature for mutual benefit and win-win results, and the two sides have tided over some frictions in the relevant sectors over the years because of the consultations we have had with each other on the basis of mutual respect, equality and mutual benefit. Q: It is reported that Russia has blocked a proposed UN Security Council press statement that would have condemned the DPRK's latest missile launch test. What is your comment? A: The UN Security Council has its rules of procedure and ways of addressing matters, including informal consultation which is in fact a closed-door meeting. What I have learnt is that the Security Council members are debating whether to issue a press statement with regard to the latest developments on the Peninsula. One thing for sure is that China believes that the Security Council members upholding unity and speaking in one voice is of paramount importance for the properly settlement of the Peninsula-related issues by the Security Council. 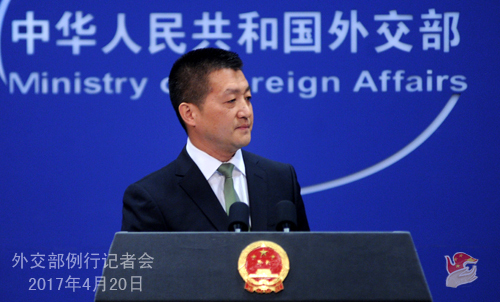 Q: It is reported that China and Iran have reached agreement on the first commercial contract for the renovation of the Arak heavy water reactor which will be finalized in Vienna on April 23. Can you confirm it? A: Your information is correct. Chinese and Iranian companies initialed their first commercial contract on the renovation of the Arak heavy-water reactor in Beijing the other day, thanks to the efforts made by the two sides, which will be signed formally in Vienna on April 23. As you may already know, the renovation of the Arak heavy-water reactor is the core of the Joint Comprehensive Plan of Action (JCPOA) on the Iranian nuclear issue. The working group, established by the P5+1 on the Iranian nuclear issue and co-chaired by China and the US, is in charge of cooperating with Iran to implement renovation projects. Since the JCPOA went into force, renovation projects have been put on a right track of steady development, thanks to the relentless efforts of all parties. The signing of the agreement will create favorable conditions for the start-up of renovation work in real sense. 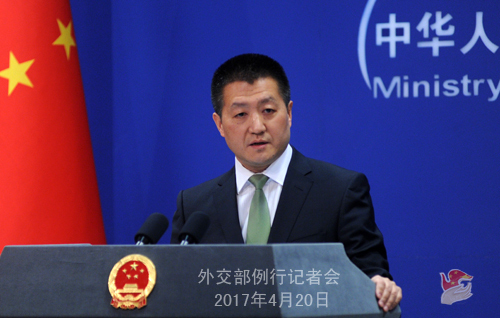 China will continue working with relevant parties for follow-up matters in accordance with the JCPOA and the consensus reached by all. I also want to say that China always firmly supports the JCPOA. With the 7th meeting of the Joint Commission of the JCPOA to be held in Vienna on April 25 by the P5+1 and Iran, the successful signing of the agreement between China and Iran will create positive impetus for the meeting. We hope that all parties can be steadfast in their political resolves, properly deal with disputes, jointly safeguard and implement the JCPOA, and contribute to preserving the international nuclear non-proliferation regime and peace and stability in the Middle East.